My fellow Blogger Paul (PA0K) used WSPR for an hour, on on February 1st 2019. His 2 watt WSPR signal has been spotted 31 times, in one hour. For Paul the most interesting spot was made by W4HOD, over a distance of 7200 km. In many spots you can see, that the propagation was not that good. I noticed an other very interesting spot, that was made by EU2AAH over 1500 km. Paul's signal was earsplitting into Belarus. When I made an analysis of the spots, this spot came up, as the spot with the best propagation. This spot reveals, that the propagation, between Paul station and EU2AAH, was very good, on that moment. To compare the propagation, I use the Lowest Possible Power, that I calculate from the used power and the SNR. A Lowest Possible power of 5 mW, can be compared to 100 mW with CW or 2 watt with SSB. Thus very good propagation. The table also shows that the propagation was good to TF3GZ on Iceland, R3TJP in Russia and EA8BFK on the Canary Islands. The second table shows the propagation, in the successive time slots, in which Paul was transmitting. Notice that, the better the propagation, the lower the Lowest Possible Power. 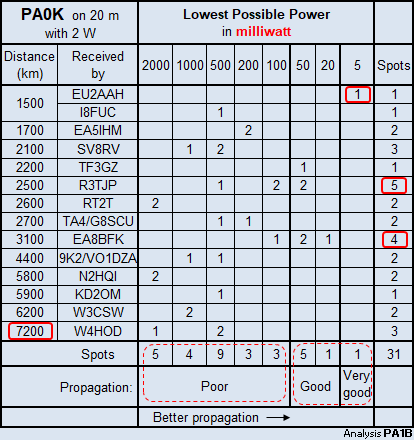 The spots made by R3TJP start with good propagation with a Lowest Possible Power (LPP) of 50 mW. In time slot 13:30 utc the signal is drops 10 dB with a LPP of 500 mW. In the last time slot the signal is up again to good propagation. LPP 50 mW. The signal received by EA8BFK is first strong, with a LPP of 20 mW, but later the signal gets a bit weaker. 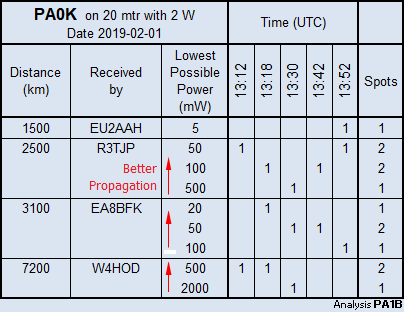 The signal that is received by W4HOD, shows a LPP of 500 mW in the first two time slots. In the time slot of 13:30 UTC the SNR is -29 dB, so all the power is needed to be spotted. Hi. Thanks Paul, for the interesting spots. Paul placed the tables, that I sent him on his Blog.